Tour the Pendleton Woolen Mill during your visit to downtown Washougal. 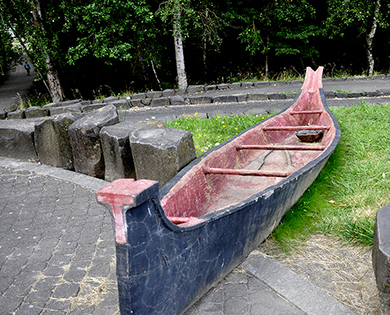 A replica dug out canoe at historic Captain William Clark State Park near Washougal. 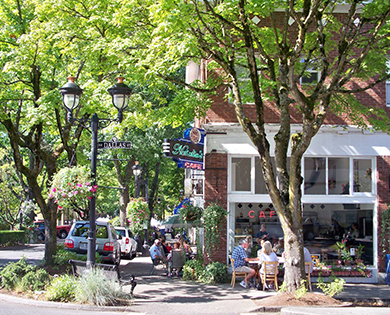 Visitors enjoying outdoor dining in adorable downtown Camas. The communities of Camas and Washougal offer an abundance of small town charm and scenic natural beauty to explore. Located at the western entrance to the Columbia River Gorge National Scenic Area, visitors enjoy shopping, dining, hiking, art, water sports, breweries, history and more." 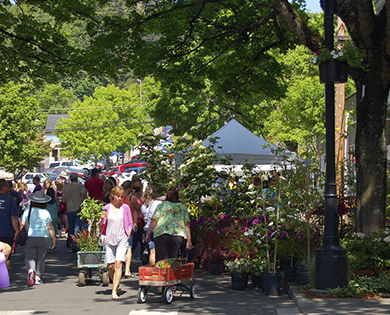 Be sure to schedule a visit to the popular Camas Farmers Market. Keep a lookout for the little bronze birds that adorn downtown's nooks and crannies. Can you find all 14? A visitor and his best friend relax next to one of Camas' public art sculptures. 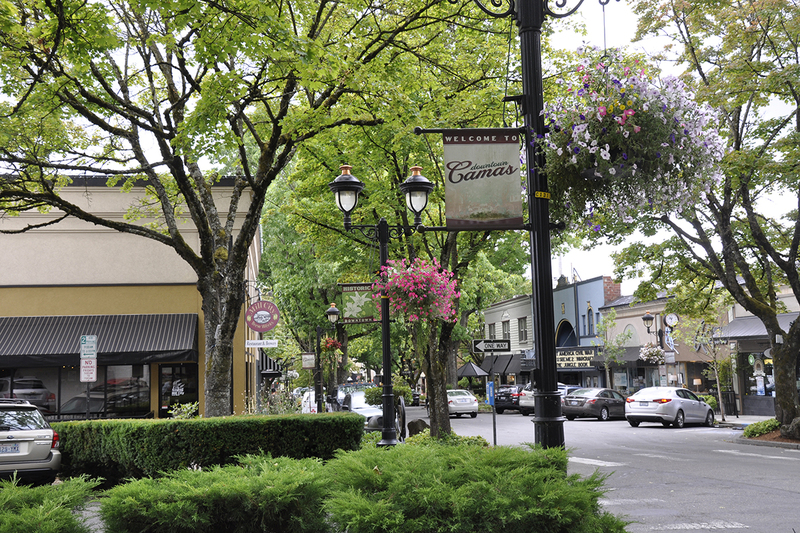 Camas’ historic downtown is a perfect place to stroll beautiful tree-lined streets and spend the day wandering through unique shops and eateries. You’ll find art galleries, boutique shops, a historic movie theater, plenty of brew pubs and more. Many surprises await! 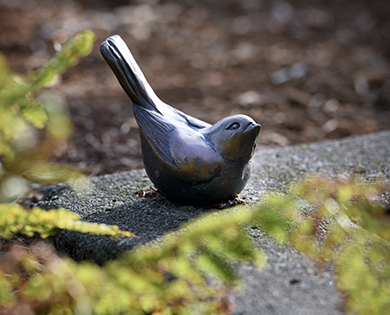 While making your way through town keep your eyes peeled for the Downtown Camas Hidden Bronze Bird Tour. Take the challenge to find bird statues located on each city block! There is a total of 14 life-sized birds to discover including a woodpecker, dove, wrens, nuthatches, ducks, chickens, chicks, a stellar jay, crow, osprey, and an owl… all birds native to the area. While a visit to Camas is wonderful at any time or day, First Friday of each month is made extra special with fun and engaging themed activities all evening and after-hours shopping. 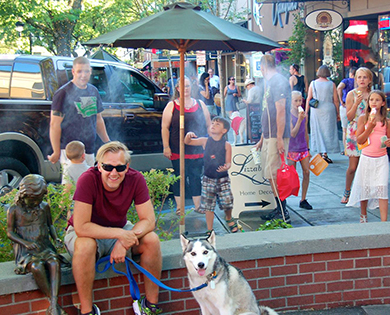 Whether it is spending the night out with your canine friend during the “Dog Days of Summer” in June or in September experiencing an Art Event featuring Plein Air (Open Air) paintings created by local artists, there is something for everyone! Each Wednesday from June to early October, the Camas Farmers Market offers a bounty of local produce and products that you won’t want to miss. In addition to freshly harvested seasonal fruits and vegetables, you’ll also enjoy live music, activities for the kids, information on gardening and healthy living and food vendors. 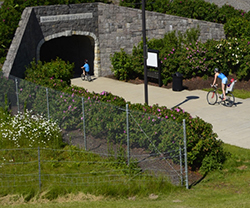 Beyond the downtown there are many activities for outdoor enthusiasts including hiking, biking, kayaking, SUPing and fishing at nearly Lacamas Lake and walks along the beautiful Heritage Trail. There is always something to do and see in Camas. The Cape Horn loop hike allows for up to 8.3 miles of beautiful scenic views along with a variety of bird, wildflower and waterfall viewing. The Bike the Dike trail is about three miles one way and follows the Columbia River from Steamboat Landing Park to the border of the Steigerwald Lake National Wildlife Refuge. Washougal MX Park is known as America’s Most Scenic Raceway. 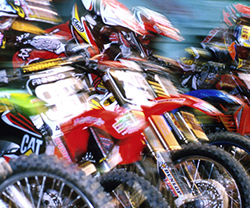 Attend the Lucas Oil Pro Motocross Championship in July. 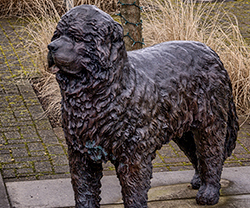 Washougal's robust public art collection includes this bronze replica of Seaman, the Newfoundland dog owned by Meriwether Lewis, who accompanied the Corp of Discovery on their journey. Washougal stands proudly as the western Gateway to the Columbia River Gorge and is a favorite stop for those on a gorge adventure. Washougal played host to Lewis and Clark’s Corp of Discovery in 1806 and is now a place to discover scenic trails and waterways, history, shopping, public art and events. Steigerwald Lake National Wildlife Refuge consists of 1,049 acres of former Columbia River flood plain and features shallow ponds, marshes, open fields and riparian woodlands. Bring your binoculars and be in awe of nesting eagles, visiting swans and the nearly 200 species of birds that have been recorded here. A relatively new attraction is the Washougal Waterfront Park at the Port of Camas-Washougal. 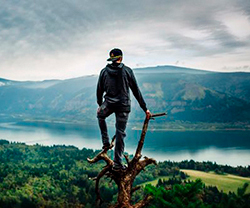 This park and trail (pictured above) offers spectacular views of the Columbia River and Mt. Hood and features educational signage and artwork. The wide, paved pathways are perfect for a scenic, easy stroll. Cottonwood Beach at Captain William Clark Park provides excellent access to the Columbia River for swimmers and boaters. This long sandy beach is perfect to bring your summer picnic and enjoy sunbathing, swimming, kayaking and water skiing. The park also includes multi-use trails, restrooms, historic interpretive elements, picnic shelters and lots of parking. Two Rivers Heritage Museum offers a glimpse into the past of both Camas and Washougal with displays on Native Americans, farming, industry and home life. 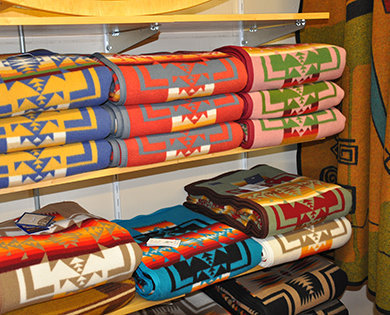 It is conveniently located across the street from the Pendleton Woolen Mills, so visitors can take in a mill tour or shop at the Pendleton Woolen Mill Outlet Store for amazing deals on Pendleton blankets, men’s and women’s fashions and accessories. Washougal also boosts a vibrant public art movement. Visitors can discover the more than 30 installations of public art, located throughout the town using the handy and colorful map produced by Washougal Arts and Culture Alliance. The works ranging from whimsical to historic and features a variety of art mediums. The Lucas Oil Pro Motocross Championship held each July at the scenic Washougal Motocross Park has given Washougal international recognition. The park hosts many events including vintage motorcycle and mountain bike competitions, mud runs and bring visitors from around the country and world. Other Washougal events include an Art Festival, Fourth of July Fireworks, Octoberfest and more. Visitors love to Keep Discovering Washougal.